Join us for great careers, flexible working hours and the option to work from remote locations. 1. Academic Experts Graduates, Post-graduates or Ph.D. Holders. You should be passionate about researching on topics and compiling relevant information. Of course, you should have a flair for writing and conveying even the most complex details in easy-to-understand language. And oh yes, you can work remotely. 2. Quality Assurance Executives Graduates, Post-graduates or Ph.D. Holders with an eye for detail and a mind for perfection to be part of our internal QA team. Should possess a strong knowledge of spoken and written English. Should check all assignments for any possible error. Assignments should be delivered to our customers only after passing internal QA. 4. SEO Experts You should be passionate about digital marketing - all aspects of it. You should know on-page and off-page SEO, Social Media Marketing and Content Marketing like the back of your hand! We welcome talent, no matter where you are located. If you can drive and deliver great results for our customers and be a part of our larger team, we want to talk to you! As any other company, we only ask that you focus on your deliverables - which is, academic success for all our customers. Never miss (assignment) delivery deadlines because that could have serious implications for our customers. Your work should be authentic. We have zero tolerance for plagiarism, in any form. Fly in your resumes to info@urgenthomeworkhelp.com. HOW TO ORDER ONLINE ASSIGNMENT HELP? You can also chat with our customer success managers on our website any time of the night or day and tell us exactly what you need and when. Share any relevant documentation. Tell us if you would like us to follow any particular referencing style. Specify the word count. 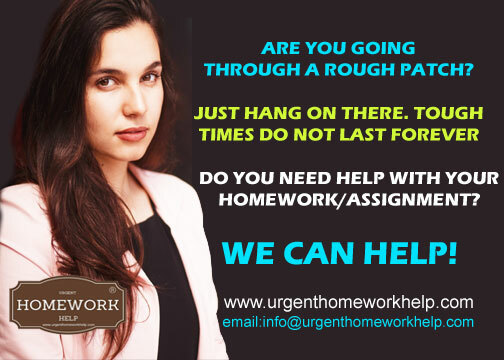 CLICK HERE FOR A FREE QUOTE FROM OUR ONLINE HOMEWORK EXPERT FOR COLLEGE HOMEWORK HELP. I had almost forgotten about my assignments. But, thanks to UrgentHomeworkHelp.com, I was not only able to submit my assignment on time but also ended up among the top scorers in my class! Though, I must confess, I was a little sceptical about their "Overnight Assignment Help" concept but it was a good decision I had taken - to go ahead with them. I would definitely recommend their services to everyone!